Pick up in store only. No shipping. Strawberries cannot be shipped but you can order and pick up in our store! Preorder your strawberries now and choose your pick up date! Available beginning Monday, February 11, 2019! Dorothy's fresh strawberries are unparalleled. Our fine Swiss chocolate was made for the big, lush strawberries we feature. And did you know that chocolate and strawberries have a synergistic effect -- raising the health benefit of each when eaten together -- so you or your Sweetie can indulge -- with no guilt! 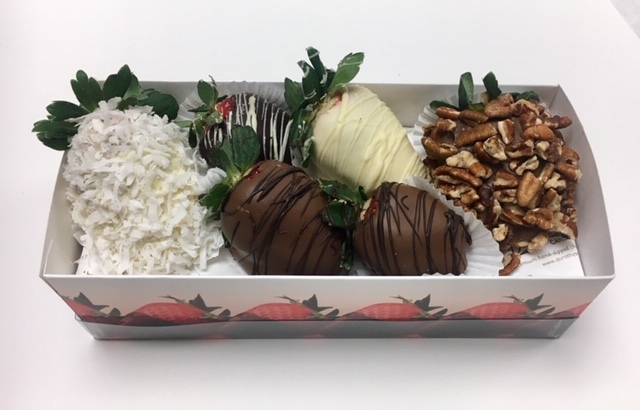 Our Extra Fancy Fresh Strawberries come specially decorated including: Swiss Chocolate, Dark Chocolate, White Chocolate, Pecan and Coconut.